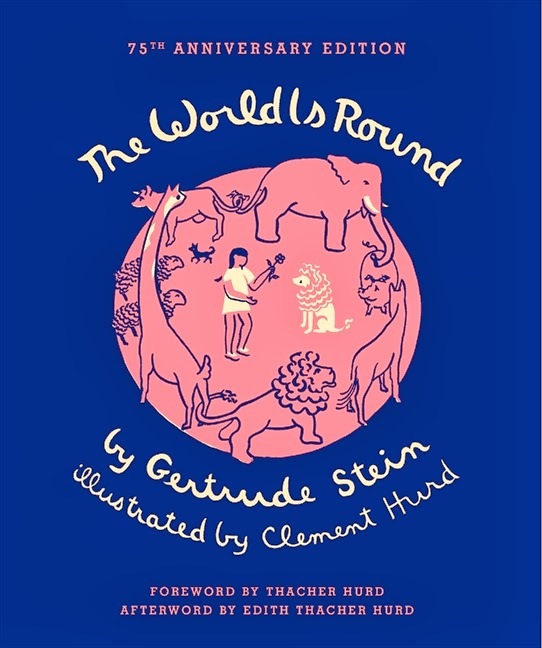 Today's give is the brand new edition of The World is Round by Gertrude Stein, illustrated by Clement Hurd, a book that was first brought to my attention years ago by my favorite blogger, Ariel Winter. In this 75th anniversary edition (that is pretty hefty and swank, BTW), Harper Design includes a foreword by Thacher Hurd (Clement's son) and an afterword by Edith Thacher Hurd (children's book author and Clement's wife). Very nice edition of a fabulous book. To win your very own brand spanking new copy of this, the only children's book by a literary legend, simply comment on this post before midnight CT on Sunday, November 24. A winner for this give (and the other four daily gives) will be selected at random and the winners will be announced Monday the 25th. Make sure you check back on Monday's post to find out if you're a winner! I love Gertrude Stein and would be floored to own this book! So excited about this awesome opportunity, thank you!!!! Yes! I want this one! I really, really want this one. But good luck to all anyway. One of the few Hurd books missing from our collection! It is AWESOME that it has been re-released. Hat in! Oooh, Clement Hurd and Gertrude Stein -- Looovely! Just heard about this book on NPR and sounded like an interesting book. I'm not familiar with this one, and would be delighted to win a copy. I've been dying to get my hands on a copy of this! I'm so glad they finally reprinted it. I would love to have you throw my name! Thank you for the opportunity. Ooh, yes, sign me up for some swank pink literature! I love both Stein and Clement Hurd -- what a treat it would be to win this book. Thanks. I've been waiting for this book!! Great giveaway! I would love this book! Count me in! I would love to read this book to my child. Sounds like a wonderful book... Sign me up! What a beautiful book! I'd be so excited and proud to be its proud new owner! Thanks for an amazing competition! What a great discovery. I would love to add this book to my collection! I read an article about this book when it was released a few weeks back, and am excited about it. Toss my name into the hat please! and thank you! I'd love a chance to add this to my collection of children's books. Thanks! We would love this book! my son loved clement hurd's "good night moon" illustrations when he was just a wee 4 month old. i think we'd both enjoy this one. This was a favorite title as child and pleased to have my memory jogged! Looks like a beautiful re-issue. Thanks for the chance to win a copy. lovely book! would love to share with my family over the holidays! This book looks beautiful ... Sure would love it in my classroom! Thanks for another lucky chance! Love this precious book! Thanks for the chance! Love the look of the illustrations on this. I would love to win this one for my daughters!